The Woman's Speaker Series presents Kelly O'Connor McNees discussing Undiscovered Country on Monday, September 24, 7:00 reception, 7:30 talk. Tickets are $30, $25 for Lynden members, and includes admission, a copy of the book, and light refreshments. Visit lyndensculpturegarden.org/kellymcnees. 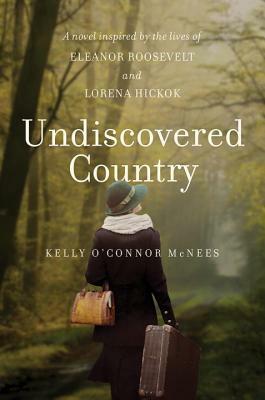 InUndiscovered Country, Kelly O'Connor McNees adroitly mixes fact and fiction to present an intimate portrait of the love that bloomed between these two women, hidden in plain sight. Using historical records (including the more than three thousand letters the pair exchanged over a span of thirty years), McNees portrays their relationship from their introduction as reporter and subject through their intense first meetings, their burgeoning affair, and the conflicts that arose as journalist Hick's ethics were hopelessly compromised by her affection for the woman she was supposed to be covering. A remarkable portrait of Depression-era America (including Hick and Eleanor's work on the founding of Arthurdale, the federal housing project in West Virginia for homeless ex-miners), Undiscovered Country is thoroughly researched, highly readable, and beautifully subtle--an extraordinary portrayal of one of the greatest unknown love stories in American politics.